It's quite necessary to set an iPhone backup password for safety concerns, which restricts unauthorized access to your iPhone backup. However, this password sometimes causes trouble for those who forgot iPhone backup password. If you are looking for iPhone backup password recovery solution, read on to learn how to recover iPhone backup password. Let's start with some basic information about iPhone backup password. The iPhone backup password is also known as iTunes backup password. If an iOS device is protected with a password, iTunes prompts you to enter the password when you connect to your computer. Once you successfully enter the password, iTunes will recognize that device as authorized and you will not need your password to back up or sync. When restoring from an iOS 4 (or later) backup, if the device had a password set, iTunes will ask if you want to set a password (and remind you that you had protected your device with a password). As Apple employs strong password protection on the iTunes backup password, we have to find a professional password recovery program to help once you forgot the iPhone backup password. iPhone Backup Password Recovery (for Windows) is a popular program to help you recover password on iPhone backup for Windows computer. It features 3 different types of attacks, namely Brute-force Attack, Brute-force with Mask Attack and Dictionary Attack. 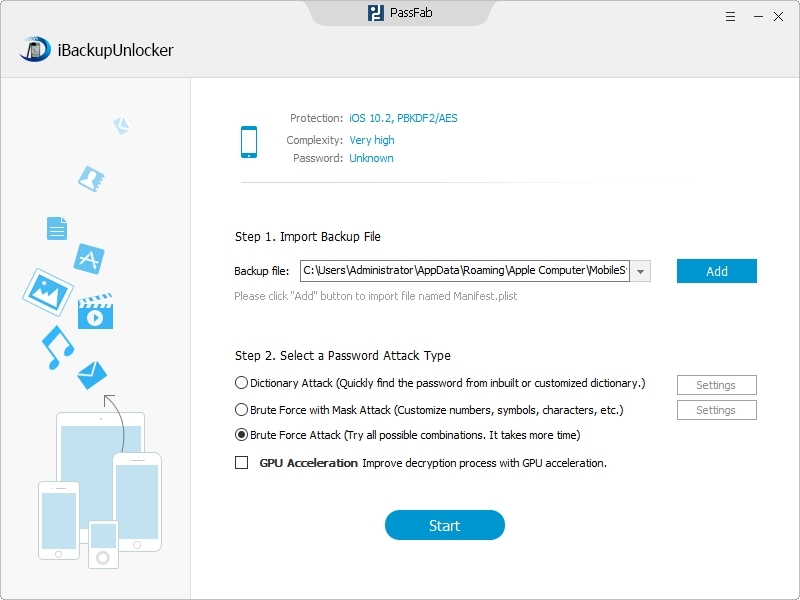 Install the software on your PC and follow the steps below to crack iPhone backup password. Step 1. Click "Open" to Import Key Container File. The Key Container File is located in the iTunes backup folders. You don't have to know where it is stored as the program will automatically detect this file for you. You just need to finish the importing with a few clicks. Step 2. Select an attack type and set it according to how much you can remember about the forgotten password. Step 3. Click "Start" to remove iPhone backup password. If you need iPhone Backup Password for Mac, you can first copy the whole folder that contains iPhone backup file to a Windows PC and then use iPhone Backup Password Recovery tool to retrieve iPhone backup password. Note: iPhone backup file location varies for different OS. If you haven't encrypted iPhone backup before, the steps below could guide you through steps to encrypt iPhone backup in iTunes. 1. Launch iTunes on your computer. 2. Connect iPhone to the computer via USB. 3. Click on the icon of your iPhone in the left menu under DEVICES. 4. Under the Summary tab >> Options >> check the box "Encrypt iPhone backup". 5. You will be prompted for a password, enter it twice. 7. Backups will be encrypted from now on when you sync your iPhone. At last, I kindly remind you to keep iTunes Backup Password Recovery on your desktop, so that you can restore iPhone backup password whenever you lose it.